A long line awaited the opening of the show. MARLBORO, MASS. – Rachel and Josh Gurley have resumed management of the traditional holiday show started by their mother, Nan Gurley, more than 30 years ago. 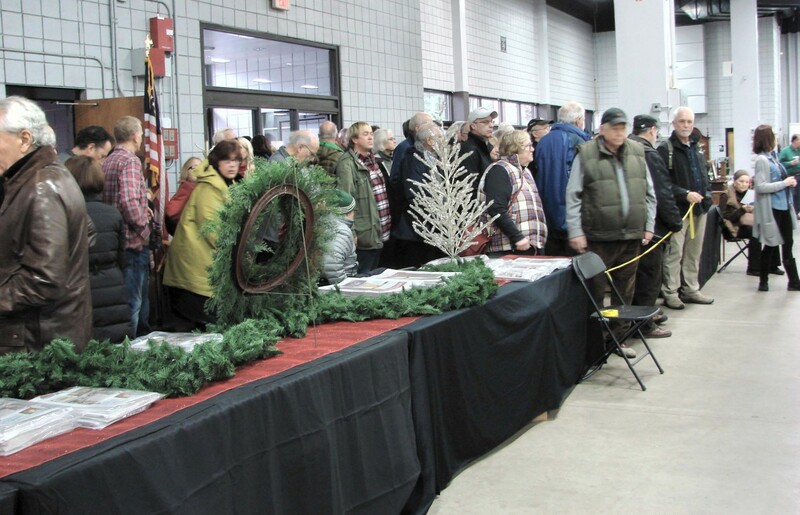 The show, on November 25, had more than 80 dealers and a large, enthusiastic crowd. 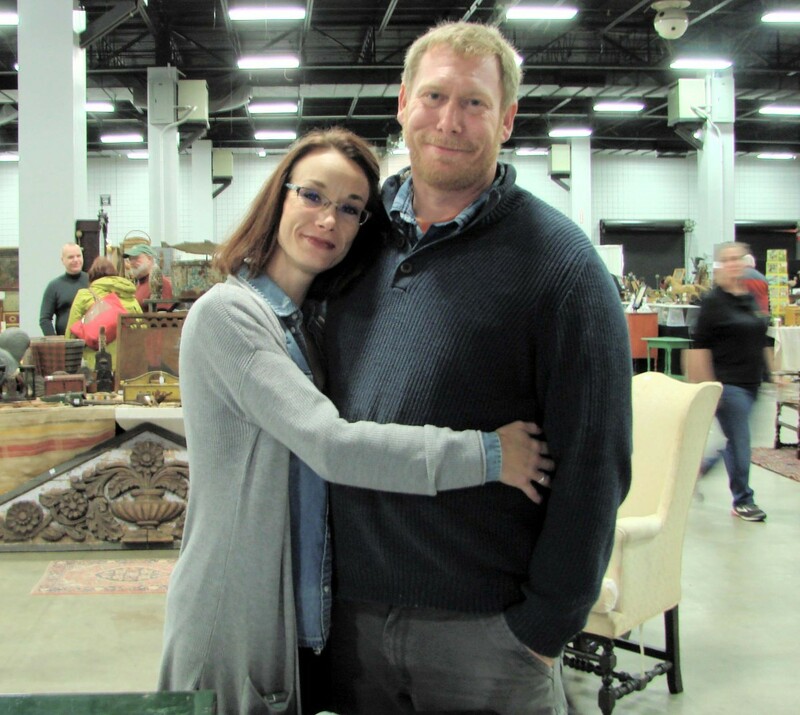 Buyers were smiling, as were exhibitors. 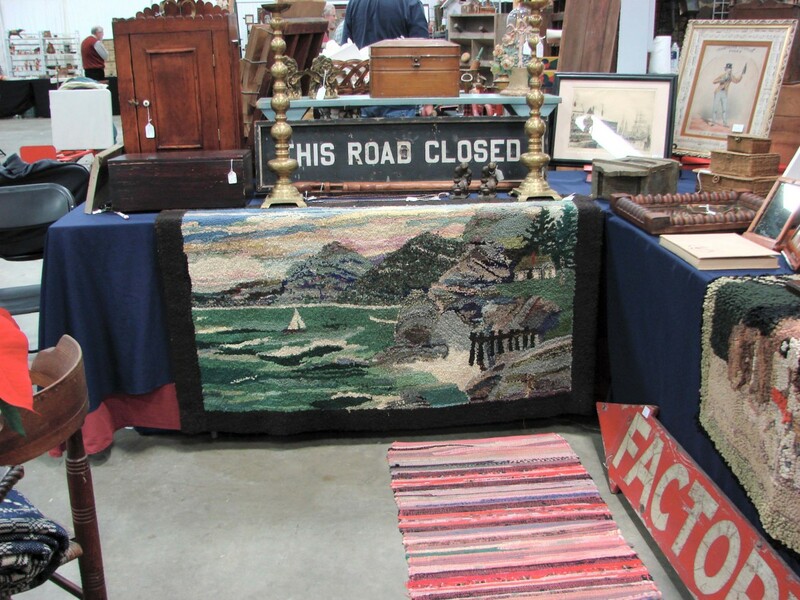 Sold signs appeared moments after the show opened and numerous dealers said that preshow business, a measure of expectations, had been strong. 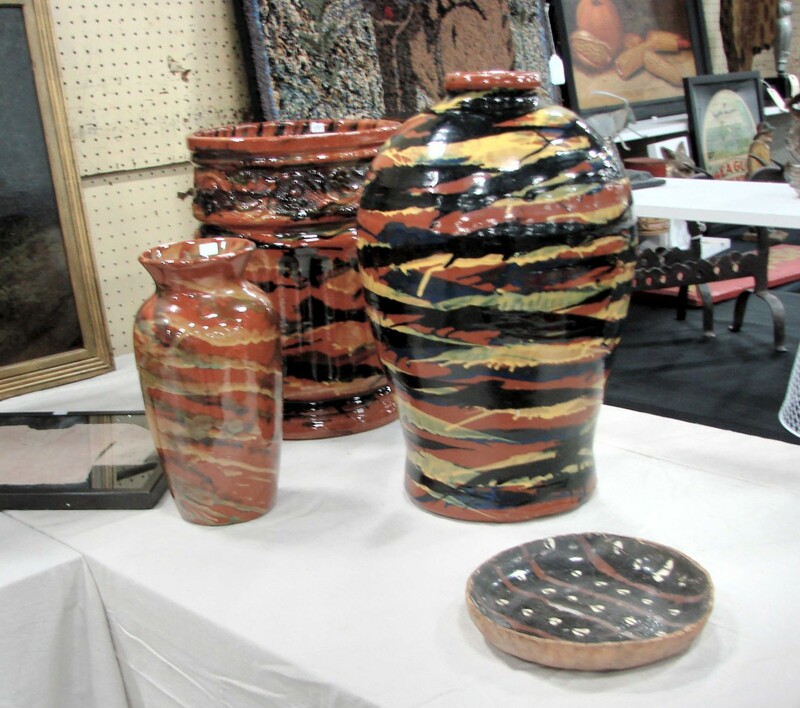 And the exhibitors who had been buying said they had bought well. 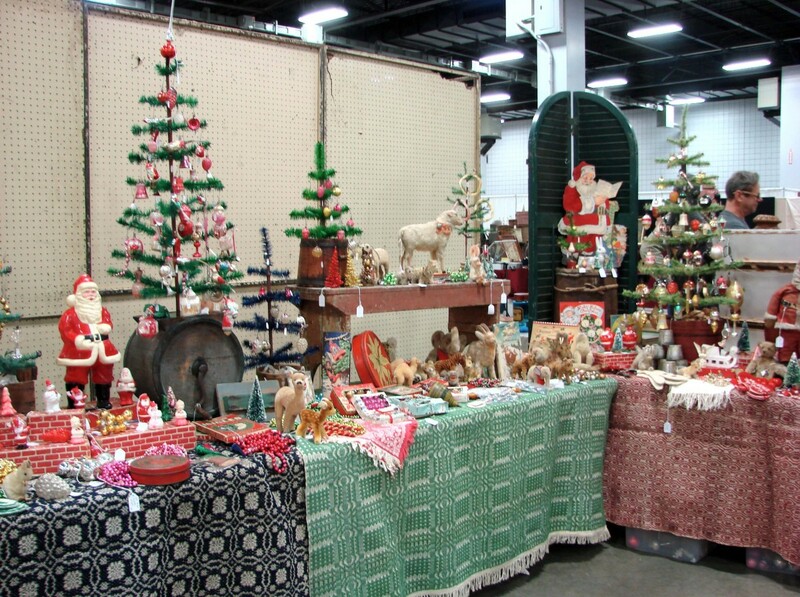 Several booths reflected the season and were decorated for Christmas with hundreds of colorful ornaments and holiday decorations for sale. 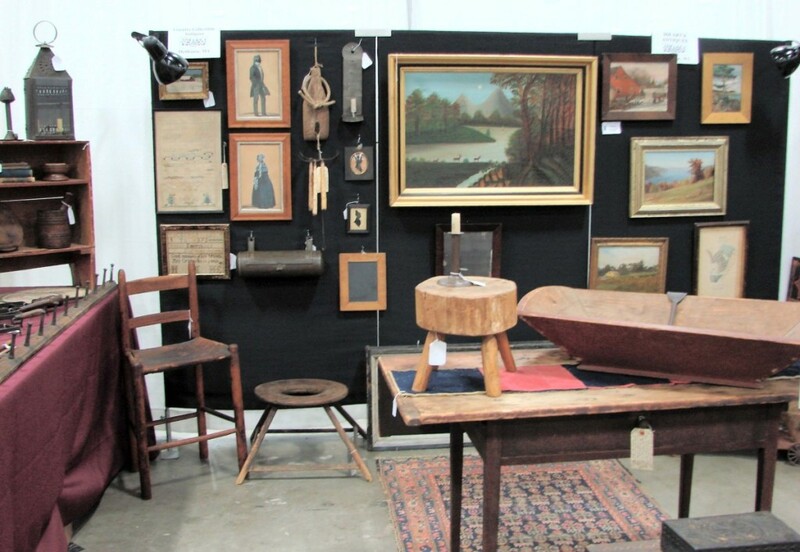 There was folk art to be had, formal and country furniture, mechanical banks and toys, paintings, hooked rugs, decoys, midcentury pottery and sculpture, and country woodenware in all colors. 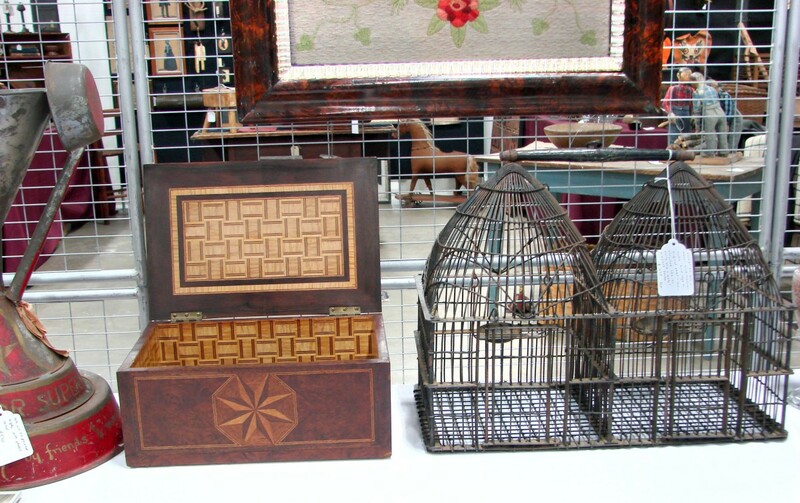 Most offerings were modestly priced, in keeping with today’s market and suitable for gift-giving. Holiday decorations could be bought for just a few dollars, though there was a $20,000 piece of furniture on the floor. There were some craft items on the floor that were just a few years old and there was a piece of prehistoric pottery more than 3,000 years old. It is not uncommon to say that “there was something for everyone” but this time there really was. 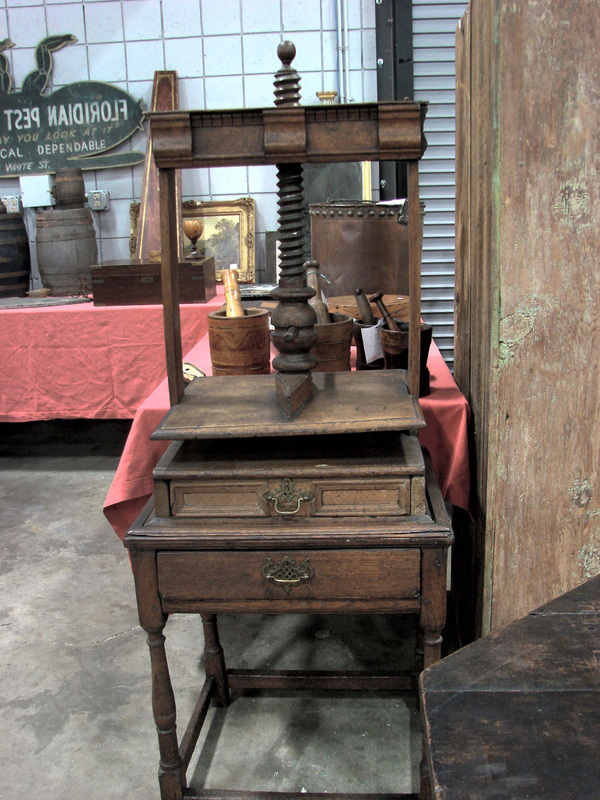 Interesting furniture included a Seventeenth Century English oak book press in the booth of Ian McKelvey, South Windham, Conn. It was perhaps the earliest piece of furniture in the show and was on a base that had probably been added in the early Eighteenth Century. The asking price was $1,195. Don Heller and Kim Washam, Portland, Maine, included a small walnut and maple Massachusetts highboy, circa 1750, that they priced at $8,800. It was only 34 inches wide. 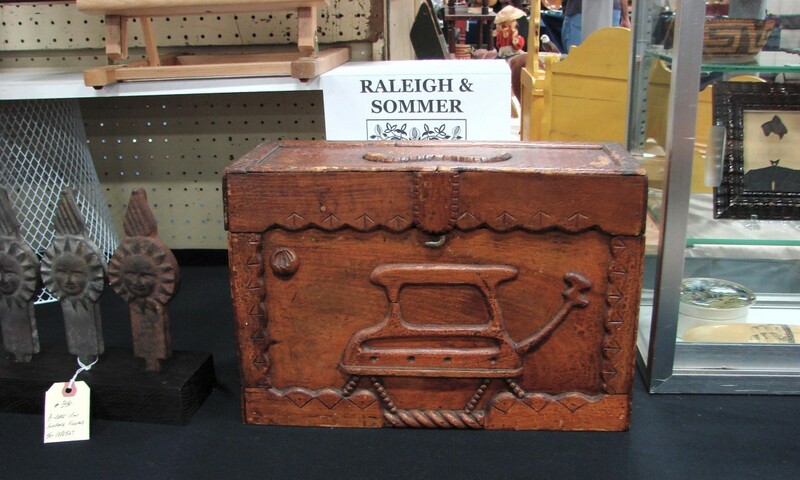 The $20,000 Newport chest on chest was in the booth of Jason Hietala, Lancaster, Mass. Hietala said that certain construction details indicated the piece had been made in Newport, R.I., and he shifted the top of the case to reveal a tongue and grooved joint carved into the top and bottom portions to prevent the top from shifting. Sherman “Sherm” Alden, East Falmouth, Mass., had an open-top cupboard in old red paint that was priced at $1,550. It looked good with a selection of pewter. 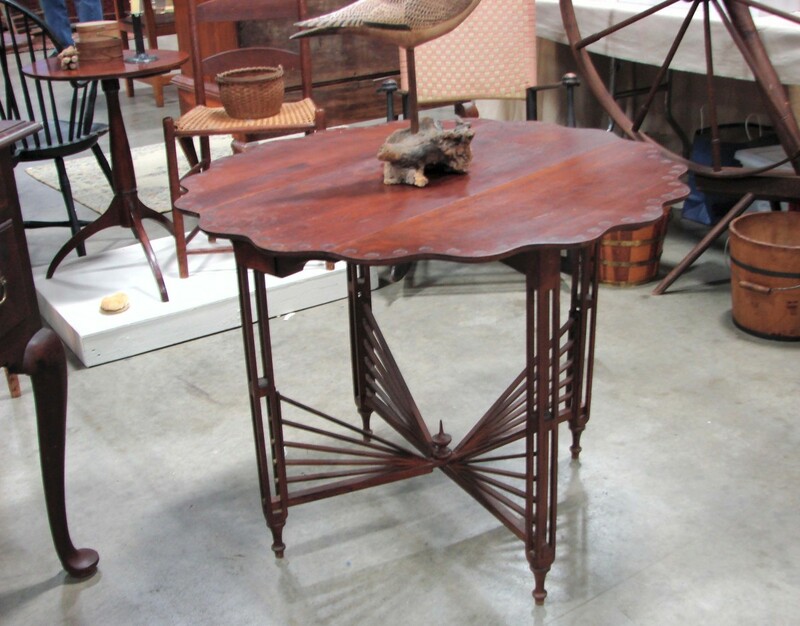 Bob Zollinhofer, Medina, Ohio, had a very unusual, circa 1930 drop leaf cherry table, which he termed “whimsical.” Its legs were spring-loaded and opened when the leaves were lifted. He priced it at $600. Early delft was available from Ross Levett, Thomaston, Maine, and John Prunier, Warren, Mass., and others. But Brian Cullity, Sagamore, Mass., had some ceramics that were even earlier, including a bowl made in Thailand that dated to 500 CE or earlier, which was only $275, and another that he thought was even older. 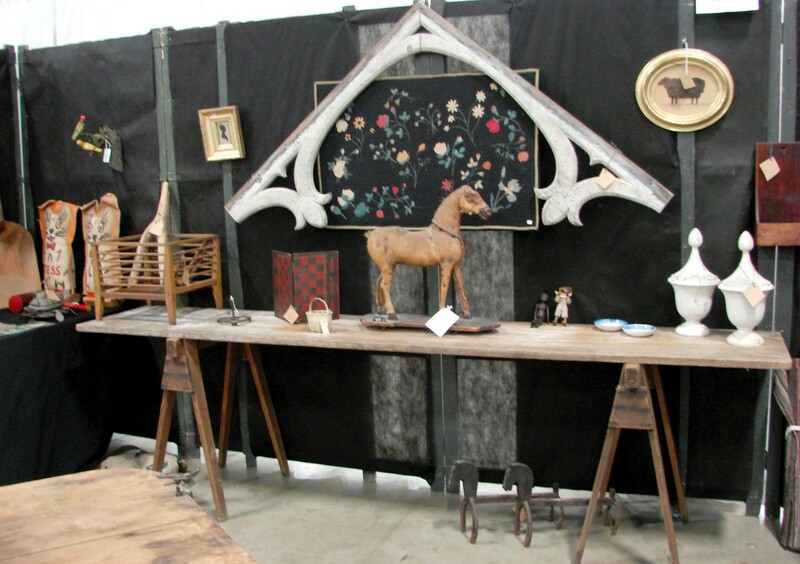 The earliest things at the show? Cullity also had some Roman glass pieces, including a beautifully colored small green pitcher, about 200 CE that was priced at $450. Those interested in cloth dolls would have had several to choose from. Pat Hatch and Kyle Hendrick, Harvard, Mass., usually have a good selection, and there were more than a dozen early examples in their booth. 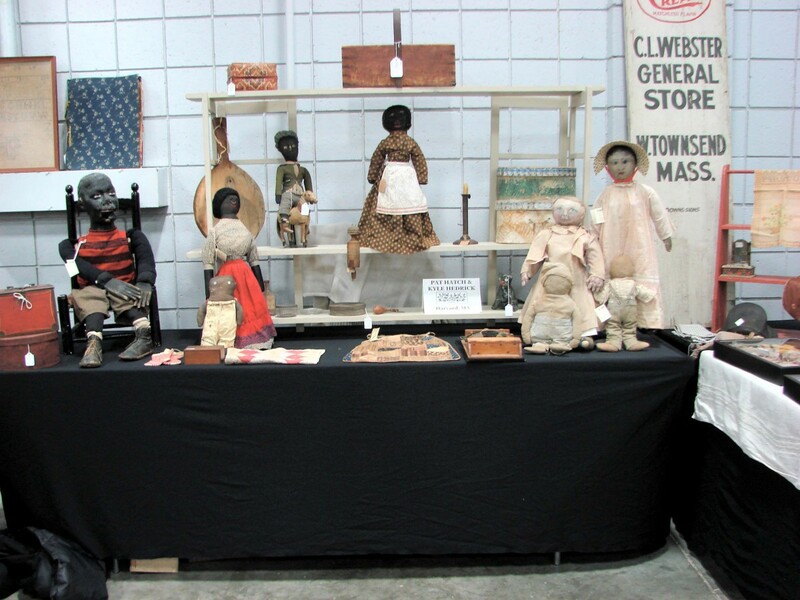 The dealers had some black dolls, including a circa 1880 well-dressed boy doll priced at $1,100. A group of three painted-face dolls included a large, dressed boy, which was priced at $1,750 and a 25-inch dressed girl priced at $1,400. A peaceful landscape of deer on the shore of a lake was $495 in the booth of MG Art & Antiques, Merrimac, Mass. 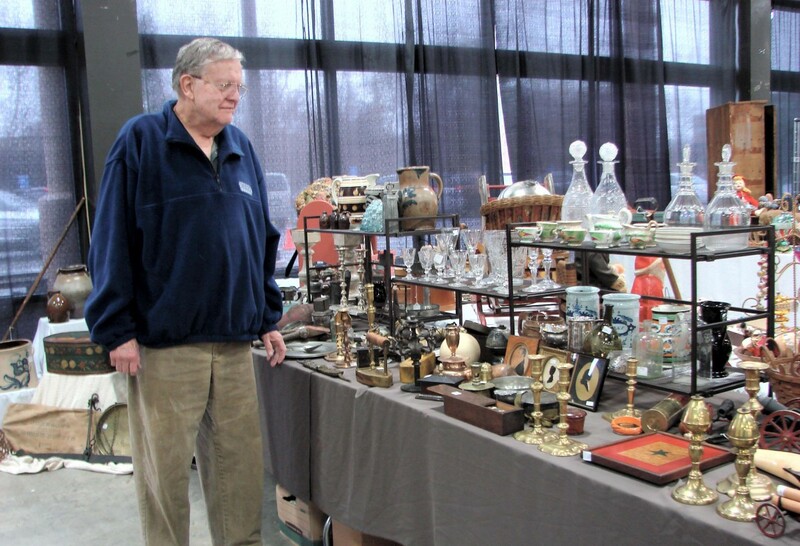 The showed was filled with many interesting, unusual items. 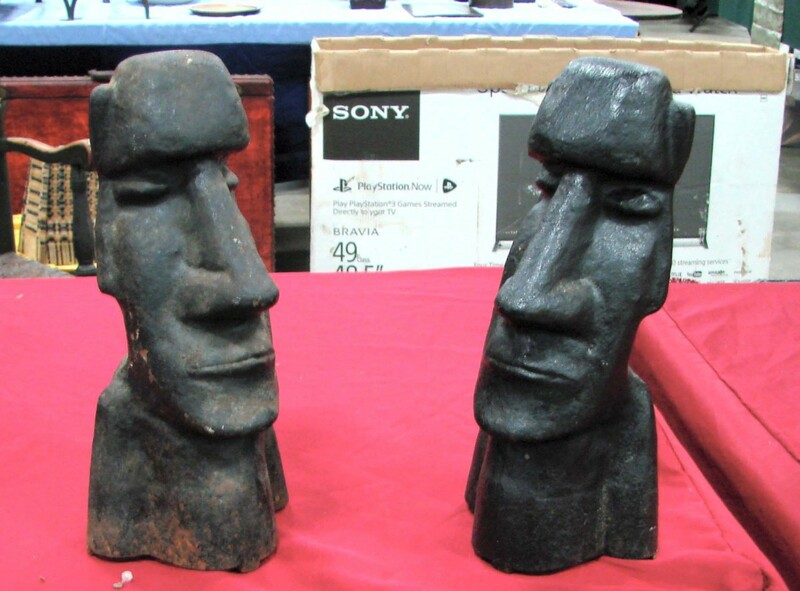 Robert “Bob” Foley, Gray, Maine, had a pair of andirons cast in the form of the stone heads on Easter Island. At $1,250, they were $2,000 cheaper than another pair now on the internet. Hometown Antiques, Bangor, Maine, had an important face jug made by North Carolina potters Claude Miller and his son. 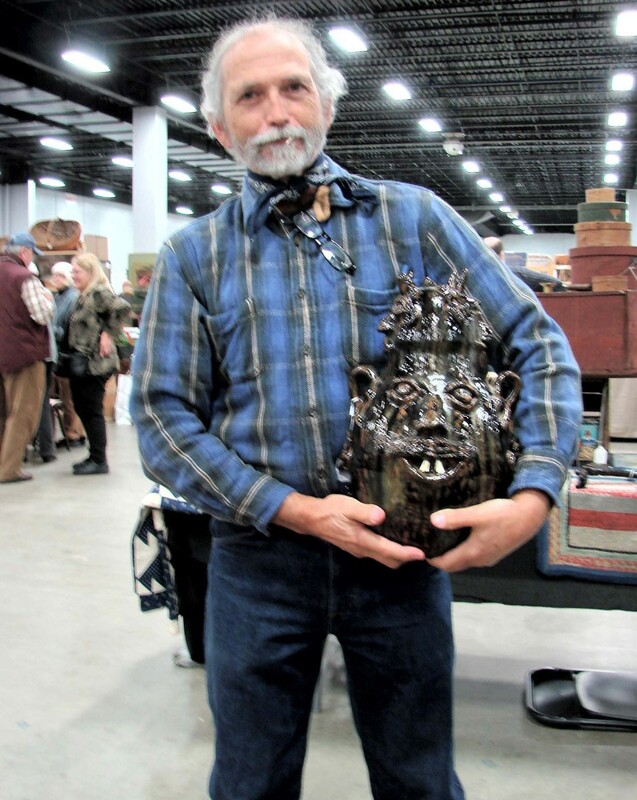 The exceptional jug had seven different faces and was priced at $2,250. John Sideli, Westport, Mass., had a large watch hutch or architectural model, in the form of a neoclassical temple with columns and a clock tower, for which he was asking $2,250. Gregory Lovell, Boston, had a booth full of blue Staffordshire and other English ceramics. MG Art & Antiques, Merrimac, Mass., had a 30-inch china head doll with beaded necklace and original clothes priced at $245. 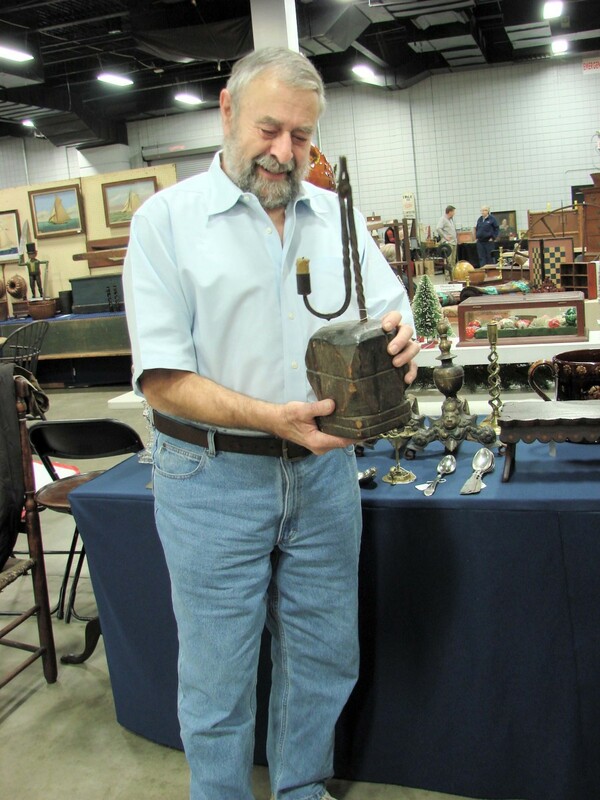 Brian Ferguson, Swansea, Mass., had a large collection of architectural box locks priced between $75 and $95. 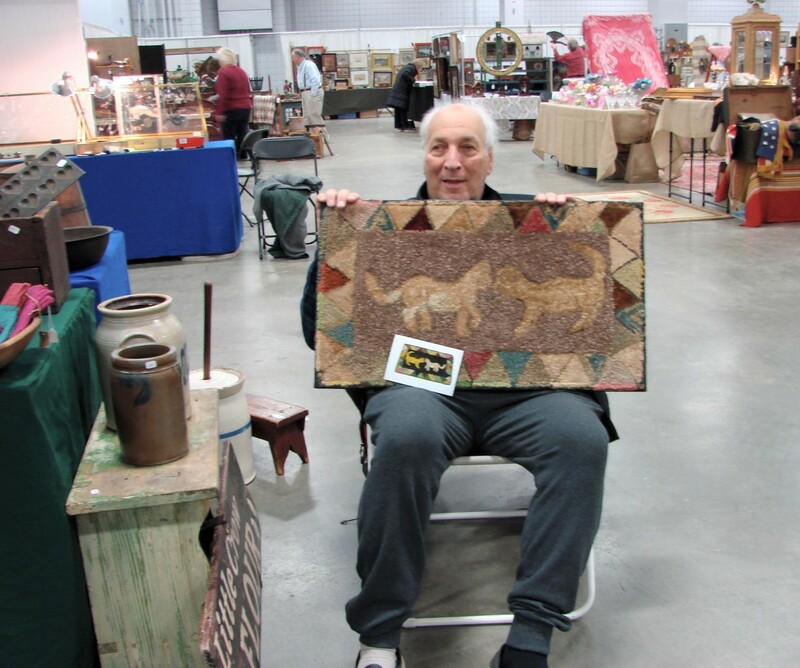 Nearly all dealers said they had done well and would do the show again. Rachel and Josh Gurley said they were pleased with the results of their efforts. “Josh and I were really nervous about this undertaking. We wanted to stay with the tradition of the location and the date, but it was a financial risk for us. 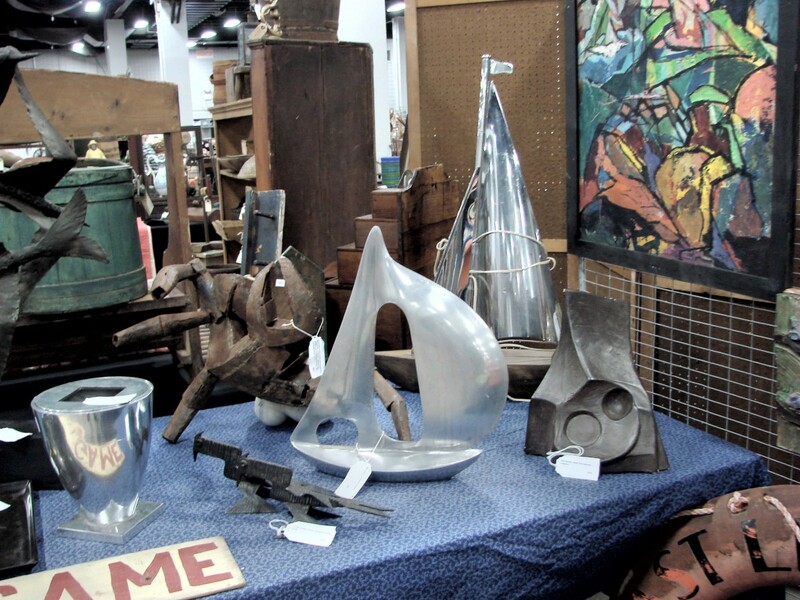 Our dealers not only encouraged us to do it, they really pitched in to help us get exhibitors. Many called dealer-friends and encouraged them to do the show and that really helped. It wouldn’t have worked without the dealers. We wound up with 82 exhibitors, more than we thought we’d have. We’ve had commitments from enough dealers that I can definitely say that we’ll have a Thanksgiving show next year. When the show opened, comments from the customers were all positive. The booths looked good and the booths with the holiday decorations added to the look. I could see from the number of packages that were leaving that customers found things they wanted. We did a lot of local advertising. We used the Boston Globe, Worcester Telegram and even the Hartford Courant. We were on the internet and we had good results with Patch.com, a free site that lists local events. The local ads brought in people who had never been to one of our shows before,” Rachel said after the show. The brother and sister team also produce shows in another nearby location that will be familiar to many: the Boxboro Regency Hotel. Their next two shows there will be Sunday, January 6, and Sunday, March 10. For information, contact Rachel at 207-396-4255 or www.gurleyantiqueshows.com. 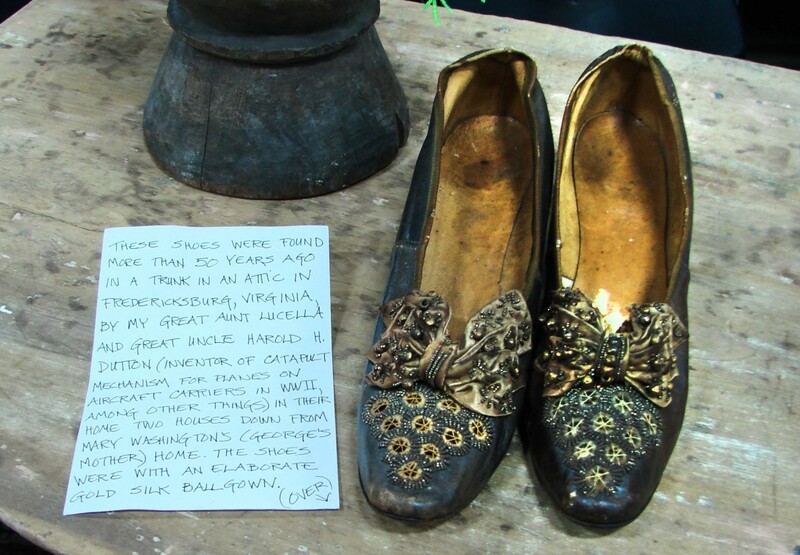 A tag that accompanied this elaborate pair of shoes said the pair was once with an elaborate silk ball gown from a home in Washington, DC, circa 1860.